The workshops planned in the second part of the day were linked to needs pupils had expressed around the most important idea they wanted to address with their classmates. 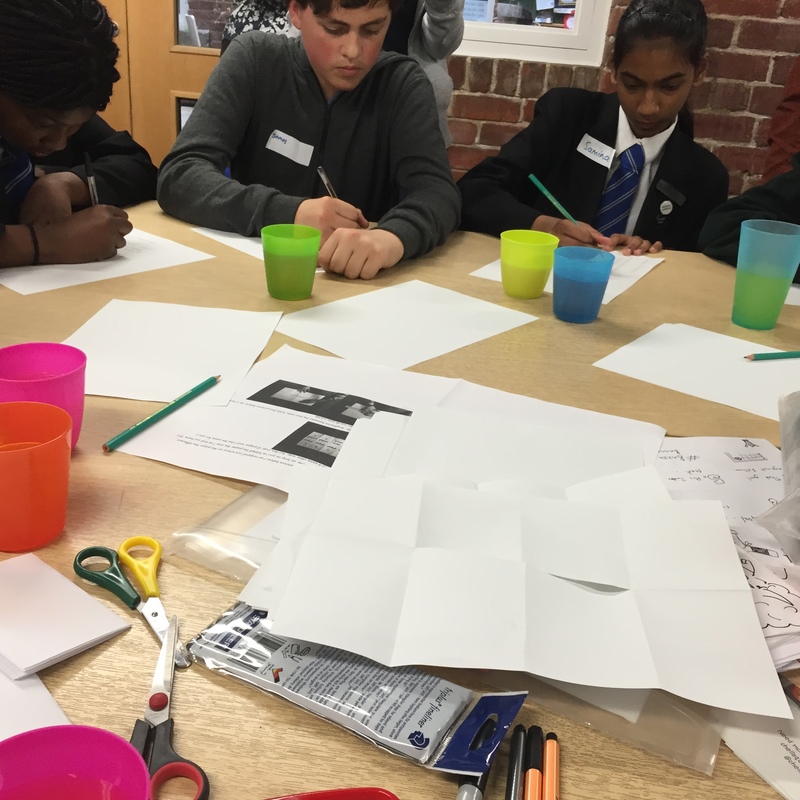 For the secondary pupils these focused on two key issues: identifying and challenging verbal and physical harassment, and sharing good etiquette that would support inclusion of trans and non-binary classmates. Chella and Becky used teacher in role and forum theatre techniques to bring up the issue of gender pronoun etiquette, this time using a different metaphor. But first, Chella asked everyone to think about whether someone had ever offended them and then spent so long apologising that they made it all about them, and didn’t really even think about or learn from their own mistake. There were several nods of recognition. Pupils identified the feelings around this as guilt, embarrassment, shame, fear of looking ignorant in front of their friends. She then asked if anyone had been afraid to get things wrong or over-reacted after making a mistake – more nods of recognition. They talked about asking for someone’s pronouns – their classmates at school who identify as non-binary or genderfluid have said they prefer to use the word ‘they’ instead of ‘he’ or ‘she’. We had a pupil time us having a quick exchange about it, and it took 12 seconds. We gave pupils a generous 15 seconds to have the same chat in pairs, and then again, swapping pairs to try it with someone else. Chella: Hi! Let’s all welcome our new friend Debra! Becky: Actually my name isn’t Debra. It’s Zebra. I’m a zebra. And then Chella went into paroxysms of guilt and melodramatic apologies all about getting it wrong for what felt like ages, until Zebra walked away to get a cup of tea. They asked the group to change the scene and make it better for Zebra. Again, they only had 12 seconds. They shared some of their scenes with us. Chella: Oh! I’m sorry – how rude of me. Everybody, this is Zebra! They asked why it was important to take the focus off yourself and make a quick apology, and the pupils discussed that feeling like you were left out or in the minority was frustrating enough – to be ignored once and have someone correct their mistake and learn from it was helpful, but to be ignored twice while the person went into a whole giant insincere apology and then made the same mistake next time was disrespectful. The pupils talked about the intersection of race and gender and we also briefly talked about microaggressions, where a series of seemingly small instances of disrespectful treatment could add up throughout the school day and have a big impact on someone overall. Carol and Boo took it from here, linking straight into a mind map session around types of harassment based on gender, gender identity and sexuality. 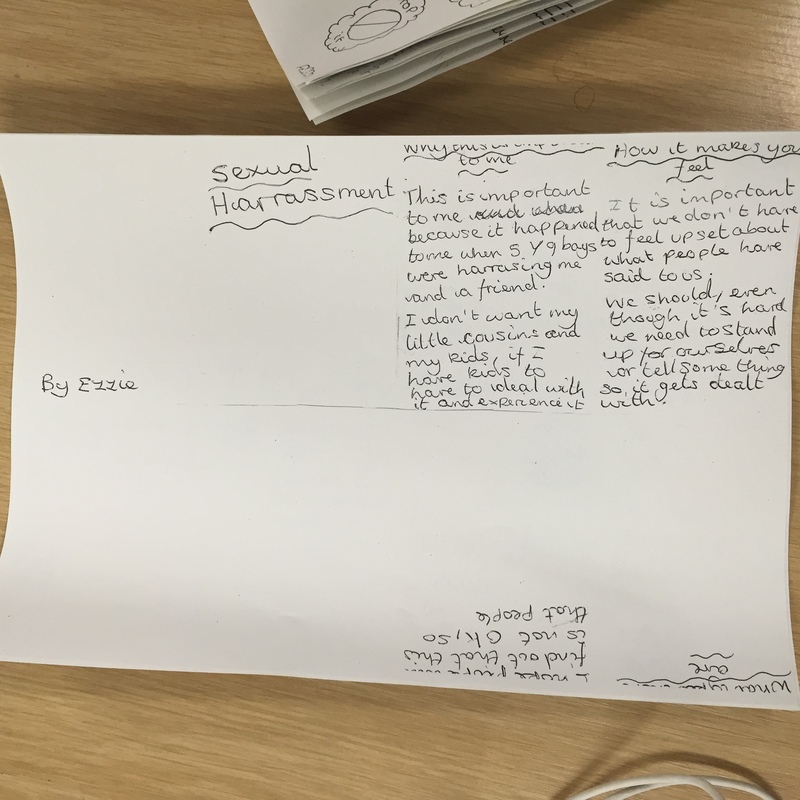 Pupils discussed words heard around school and types of verbal and physical harassment witnessed or experienced, based on a survey that a group of the Gender Respect teacher researchers had given out earlier in the term. Name calling and gender-loaded words were queried, as were certain types of touching and contact, linking back to the consent starter activity and taking it further. 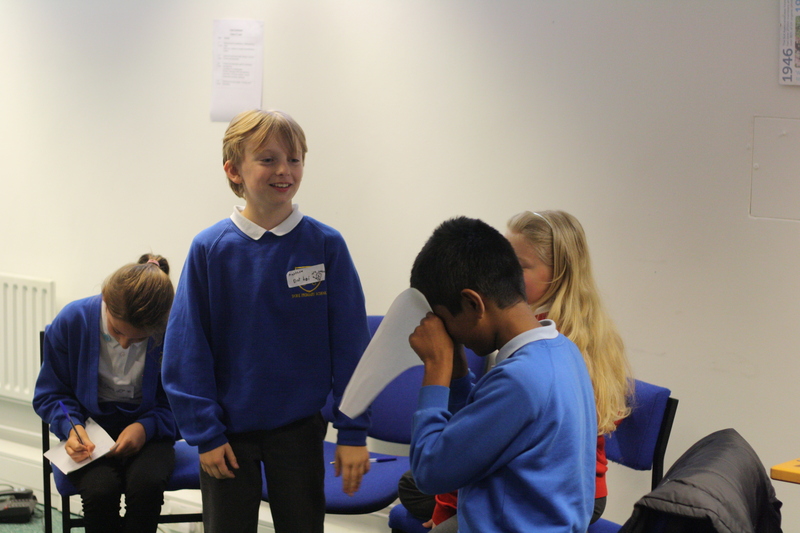 The activity ended with the group planning freeze frames and captions for image theatre, and coming up with some comebacks that could be safe and assertive responses to unwanted behaviour at school. The session led straight into a quick-fire response round. Everyone was energised and ready to take on the world of Gender Respect, and we wanted to harness that! How to get these ideas out quickly and creatively, using the pupils’ own ideas for text and artwork? In the planning session last month, some of the teacher researchers reported that their pupils felt anxious about coming to the end of the school year and not having disseminated what they’d learned yet – that big plans were hard to achieve in one lunchtime a week, or when assemblies were quite busy already. Chella thought about the project’s activism roots and then realised that the tools of art activism – murals and zines, could spread the word quickly. Murals could double as assembly presentation slides and adverts for schools with flat screens in public areas. Zines (also called fanzines) are tiny home-made magazines or booklets on any topic you like. They can be any size, but the simplest ones to make are 1-page mini zines. Here’s a good tutorial. Chella calls mini-zines ‘Paper Buzzfeed Listicles’ and bigger zines ‘paper Tumblr’ – they’re analogue social media, and they’re fun. 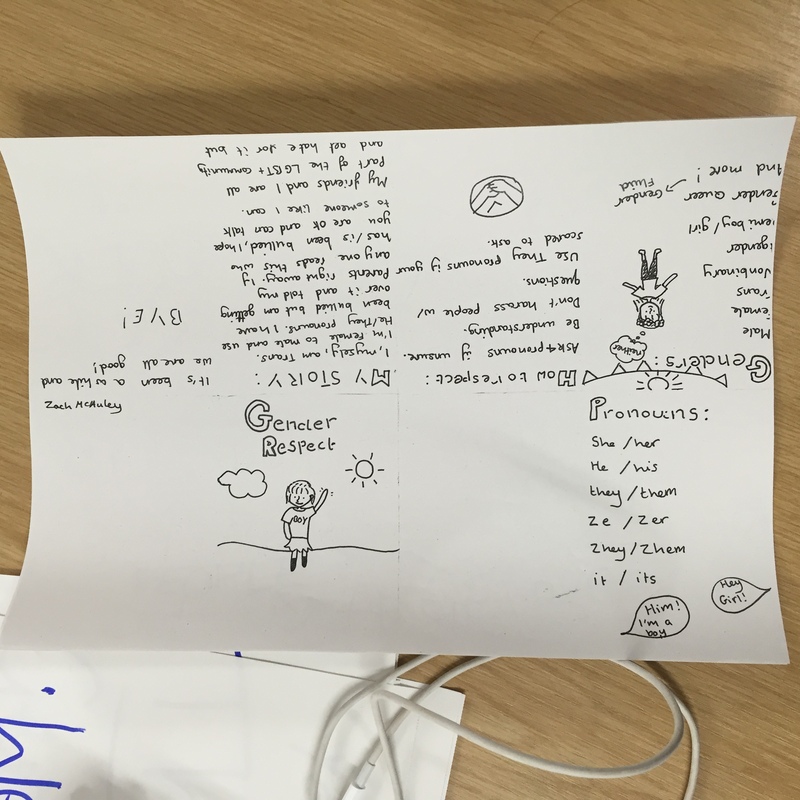 First Becky and Chella asked the pupils to choose their favourite topic they’d explored that day, and write top five things they wanted their classmates to know, then three reasons it was important to them, and come up with a doodle or emoji that would convey this issue. Becky showed her example using the Debra Zebra story to explain how to ask for pronouns and apologise for mistakes. This formed the six pages of the zine and the covers, and we got folding and cutting our zine templates while Boo, Caz, and Helen passed out snacks and juice for a working break – these kids were on a roll! 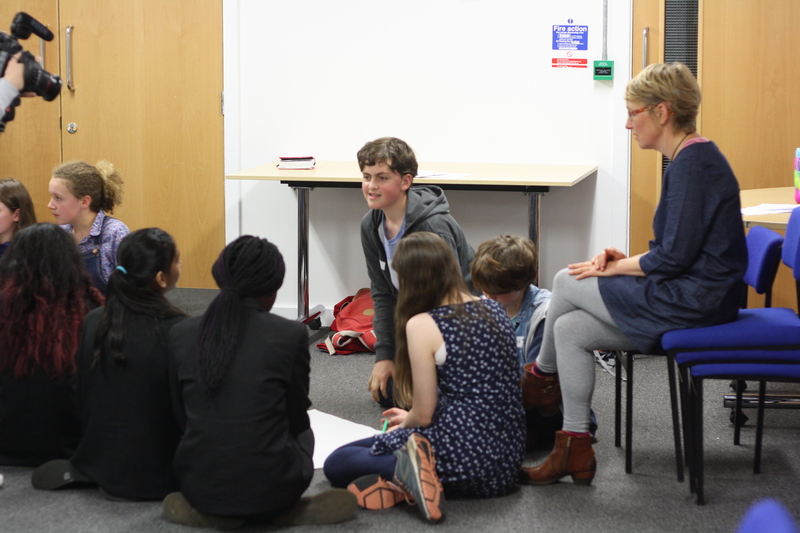 They were so energised and empowered, and their work was really impressive – even over such a short amount of time! There were some good metaphors – one pupil used a conversation between a cartoon potato and a peeler to talk about consent, and another drew one of her favourite fairy tales, Rapunzel, but with a reclaimed ending. 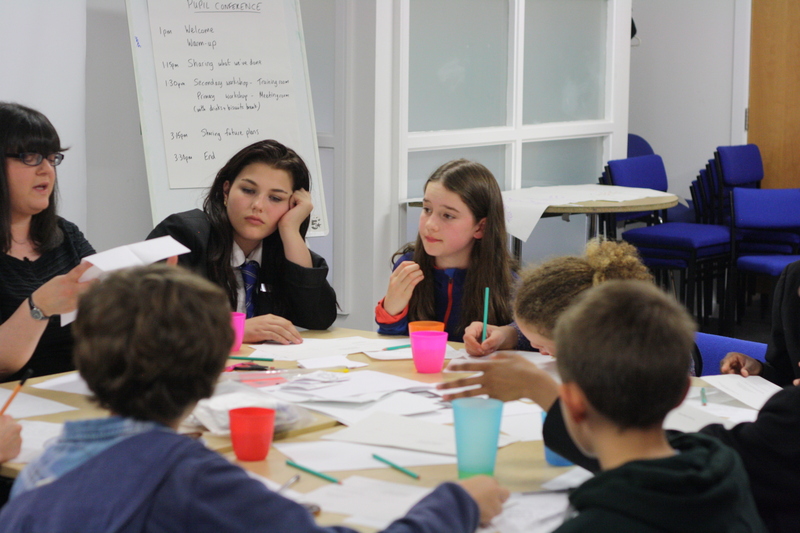 The group decided to call their zine collection, which they will complete, share and develop into presentations and murals, the SAGA Saga, after one pupil’s discovery of the phrase Sexuality and Gender Alliance in their online readings about equality, and after the Norse word for story. The session concluded with Chella inviting pupils to begin a round of powerful final thoughts from each pupil, secondary teacher and volunteer sharing something starting with either ‘I hope…’, ‘I enjoyed…’ or ‘I feel…’ – and we had some lovely thoughts all the way back to the start of the project, and excitement about the ways pupils felt empowered to carry on the project’s aims now and in future. It was a fantastic afternoon, and we are looking forward to how their work carries on back at their schools! You are working in a group with 2 girls and 2 boys. The boys keep taking the lead, making the decisions and dominating the conversation. What do you do? You are a girl and you enjoy playing games and creating a PowerPoint on the computer. One lunchtime, you are working on something and a boy comes over and takes over from you, saying he is just showing you how to do it. What do you do? You are a boy and your friend has just hit you on the arm and told you you’re no good at running. You begin to cry. Another friend comes over. What happens next? We asked the pupils to create a drama showing the scenario and what they would do next. We had a really interesting discussion about their experiences of these situations and what they did. Why is blue seen as a boys’ colour and pink seen as a girls’ colour? Are boys and girls allowed to express their feelings equally? Why is it sometimes difficult for boys and girls to be friends? Do boys talk louder to make themselves heard? Why do people sometimes get teased for doing things that the other gender does? The question they choose was: ‘Why is it sometimes difficult for boys and girls to be friends?’ The pupils said that sometimes they were teased for playing with someone of the opposite gender and people would say that they had a crush on them. They felt that it was unfair and that everyone should be able to play with who they wanted to, regardless of gender. They thought they would be more aware of it in school and would challenge people if they heard teasing. To mediate arguments relating to gender. 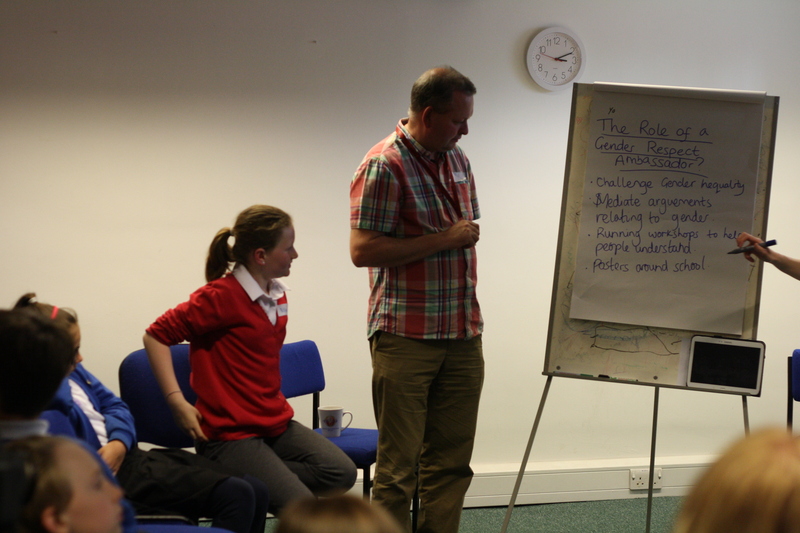 To run workshops to help people understand about gender respect. To create materials to raise awareness – posters, songs, PowerPoints. We will challenge others if we feel they are being disrespectful. All genders will be playing happily with one another. We will have equal participation. We will listen respectfully to each other. We will ensure our environment and materials reflect gender respect. Categories: Uncategorized | Tags: consent, gender ambassador, gender fluidity, non-binary, P4C, Primary, Secondary, sexual harassment, taking action, zines | Permalink.